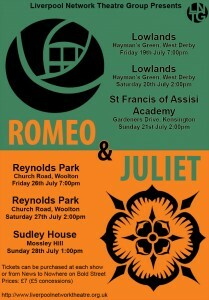 Romeo and Juliet is the story that still, after 400 years, defines young love. Despite its famous ending, it is not only a tragic love story. It also puts up a mirror to the laughter, loyalties and frustrations of everyday families and friendships. Most of all, perhaps, it shows the stupidity of ‘tribal’ conflicts, where everyone who is given a certain name must be treated as an enemy. And all of this is told in such beautiful language that, while today we may not follow every word, we can certainly feel the passions. Come and picnic at one of our glorious Liverpool venues and enjoy the show! Please note: Performances are outdoors – we recommend you bring your own seating and come dressed and prepared for British summer weather! The Liverpool Network Theatre Group is committed to staging high quality productions, accessible to ordinary people. We hope the issues in our productions are relevant today, both in our more contemporary plays, and in our historical comedies. We also run weekly workshops open to anyone over 18.